These structures are from different forms of hemoglobin. You can use these to compare hemoglobin with and without oxygen and the hemoglobin structures found in two types of sickle cell anemia (Hemoglobin S, and Hemoglobin C). See how you can use these structures, along with the mRNA, and protein sequences to learn more about hemoglobin and the sickle cell mutation. See Exploring hemoglobin with bioinformatics. Use the link on the right to download all hemoglobin structures at once. 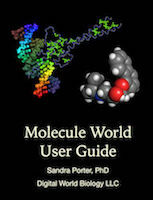 To view the collection, you will need to download and install the iPad version of Molecule World. Once Molecule World is installed on your iPad, return to this page and download the entire collection at once by selecting the mwc file. Deoxyhemoglobin: human hemoglobin without oxygen. Human hemoglobin bound to oxygen. Hemoglobin S: a form of human hemoglobin associated with sickle cell anemia. Hemoglobin C: a form of human hemoglobin associated with a less common type of sickle cell anemia, bound to carbon monoxide.